Engineering is crucial to so many aspects of our world - it keeps the world going round. 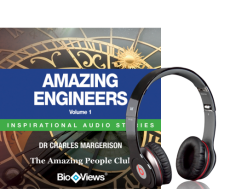 This collection of inspirational audio stories from The Amazing People Club focuses on some of the most influential engineers including Thomas Telford and George Stephenson. Each played key roles in important areas of development that included railways and canals, which ultimately were the infrastructure that made so many other advancements possible. Each story comes alive through BioViews®. A BioView® is a short biographical story, similar to an interview. These unique audio stories provide an easy way of learning about amazing people who made major contributions to our world and can help you achieve your ambitions in your journey through life.